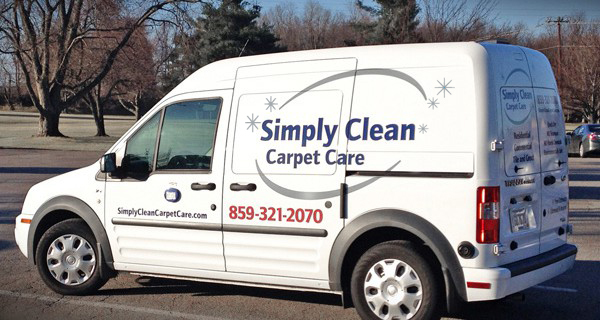 Ted Borecki of Simply Clean Carpet Care had just purchased a new van and eagerly approached the Arion Group to design his traveling billboard vehicle wrap. “Did you know mobile graphics reach more consumers than ALL other forms of outdoor advertising?” he asked. It was clear Ted knew what he was talking about. According to marketing research comparisons done by the OAAA (Outdoor Adverting Association of America) and Driving Revenues, the average vehicle driven 15,000 miles a year will pass in front of nine million vehicles. There’s no doubt vehicle wraps are some of the best bang for the buck when it comes to outdoor advertising. We explored various color combinations with Ted but finally settled on a clean, monochromatic blue and silver design. The Simply Clean phone number is the only element in red, which makes it eye-catching and easy to read from a distance. Metallic silver sparkles shimmer in the sun and catch the eye of people walking by. A business card caddy is attached to the drivers’ side door inviting passersby to get in touch with Ted. Ted parks his new mobile billboard in the most strategic spot of the parking lot at his weekly business networking meetings. Everywhere he drives it catches potential customers’ eyes. For help designing your next vehicle wrap, contact us today.